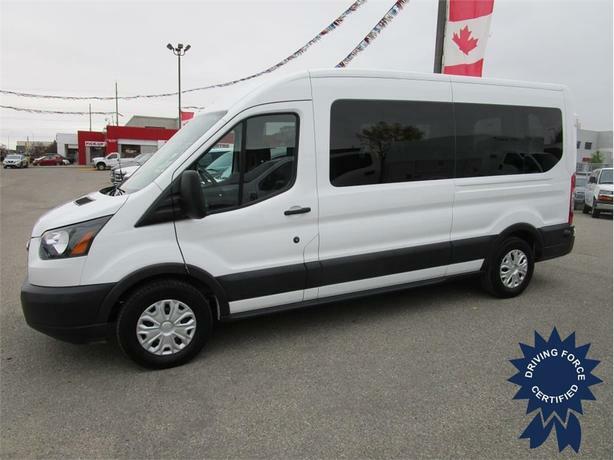 This 2017 Ford Transit T-350 XL Medium Roof 15 passenger is ready to be put into service immediately. Comes equipped with a 3.5L EcoBoost V6 Gas engine, 148-inch wheelbase, sliding side door for easy entry, rearview camera, Bluetooth hands-free calling, rear heat and air conditioning, trailer tow package with integrated brake controller, Alberta CVIP commercial bus inspected, cruise control, power windows, power locks, keyless entry, heavy duty alternator, and has been certified to our high standards. Contact one of our commercial vehicle sales specialists in Calgary today and let DRIVING FORCE be your #1 full-size passenger and shuttle van dealer in Alberta.